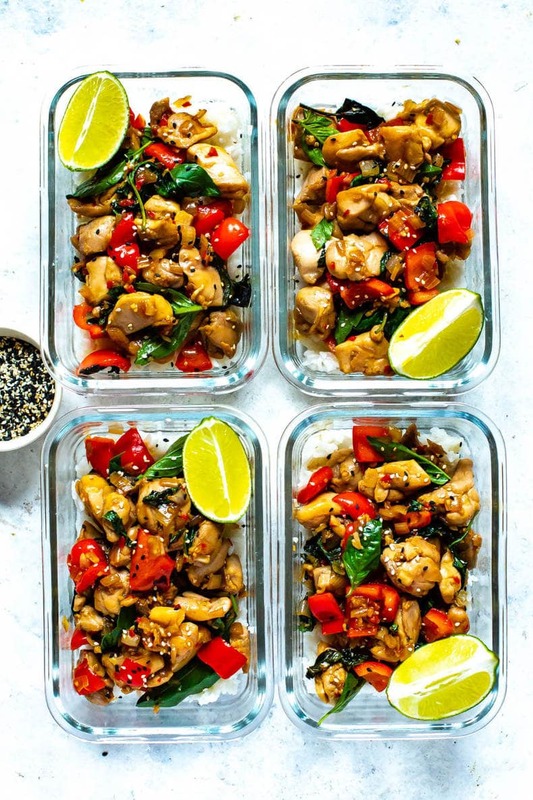 This Meal Prep Thai Basil Chicken is a healthy stir fry idea that doubles as an easy 30-minute dinner or the perfect make-ahead lunch – it's slightly spicy and packed with fresh herbs! 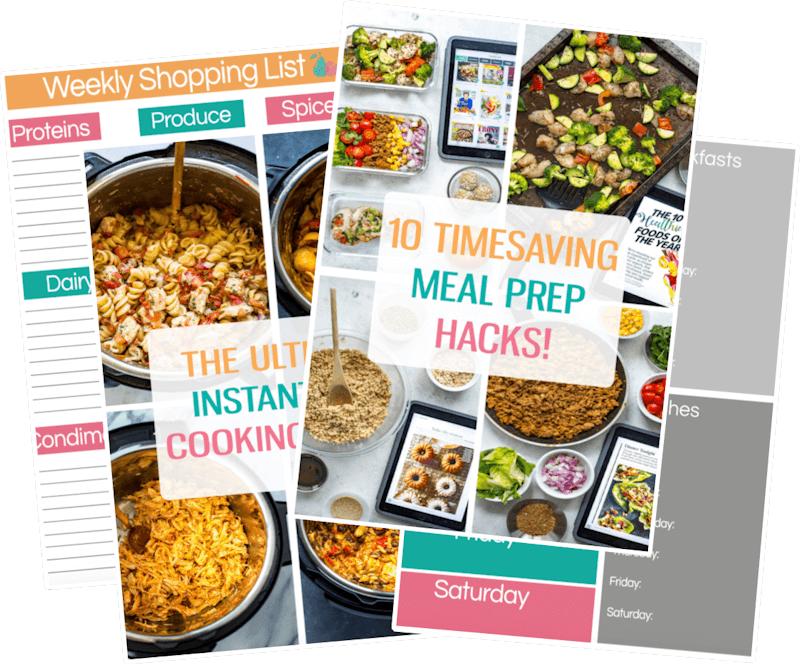 Meal prepping is a great way to save time, especially when your days are super busy! 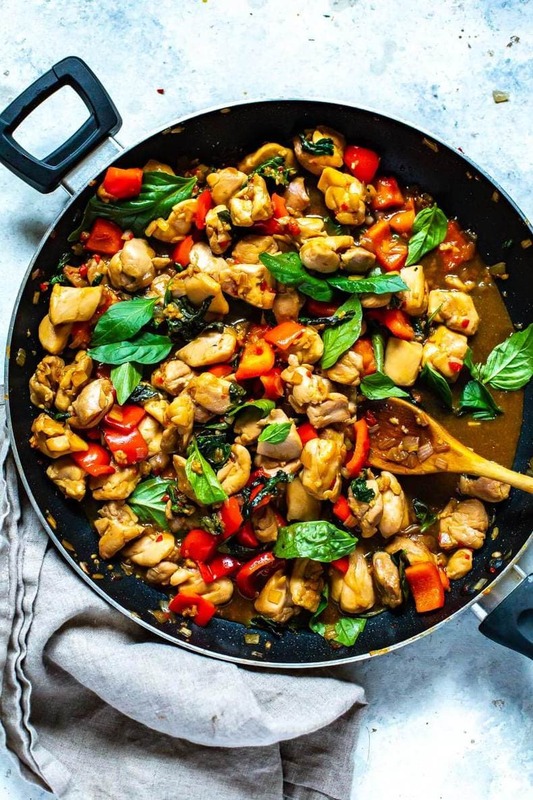 And there's nothing better than this Thai Basil Chicken skillet to save you a little bit of time in the kitchen. The last thing you want to do after a long day is walk in the door and spend an hour getting dinner ready. Not with this Thai Basil Chicken! What does Thai basil taste like? Thai basil is used in a lot of Asian dishes, especially in Southeast Asia. The flavour of fresh Thai basil is a bit peppery; a lot like black licorice or anise, but the longer it cooks, the sweeter the taste becomes. But don't worry – if you can't find Thai basil then feel free to sub in regular basil or another fresh herb such as cilantro. It will taste just as good! 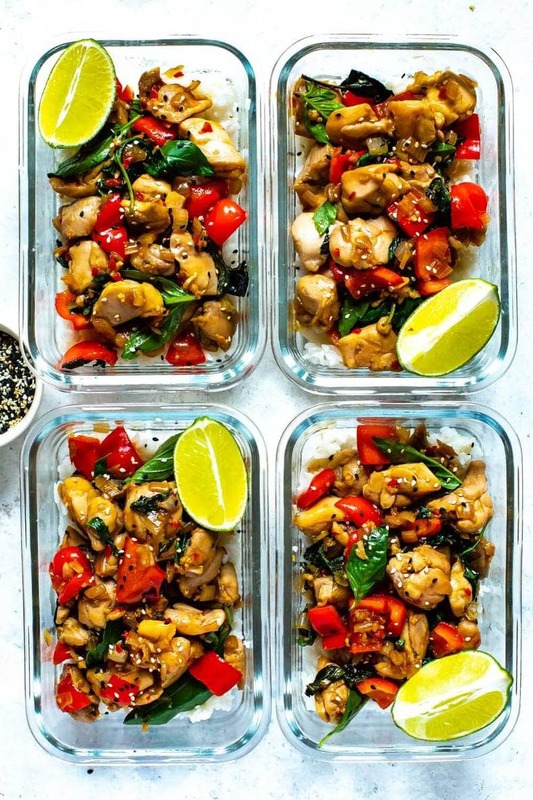 OK, let's talk a little bit about this meal prep Thai Basil Chicken recipe. It's a slightly spicy chicken dinner, sort of like a chicken stir fry, with loads of fresh veggies! I use onions, red bell pepper, and red chile peppers. The recipe is pretty versatile, so If you want to swap out the peppers and use mushrooms instead, go for it! Or use both! Maybe you want a bit more green color – add a bit of broccoli. Make the dish the way you and your family like it. 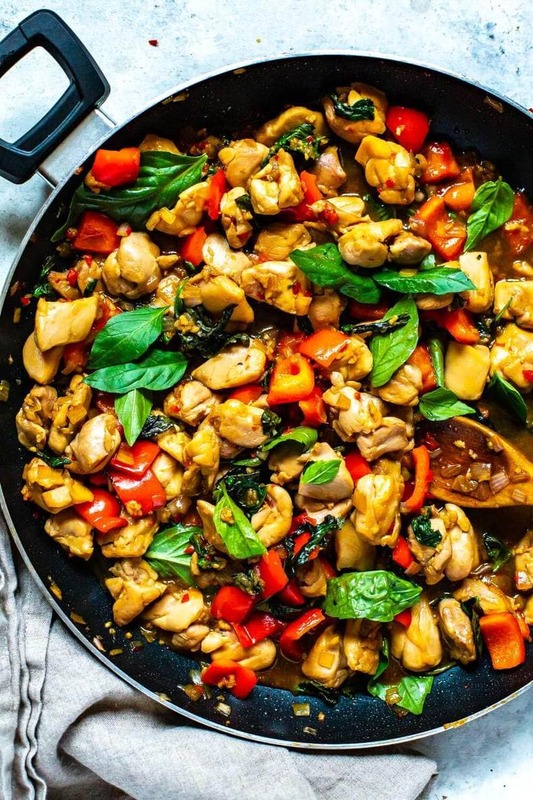 The sauce for Thai basil chicken uses simple but flavourful ingredients. I make it with soy sauce, oyster sauce, some brown sugar, and garlic. 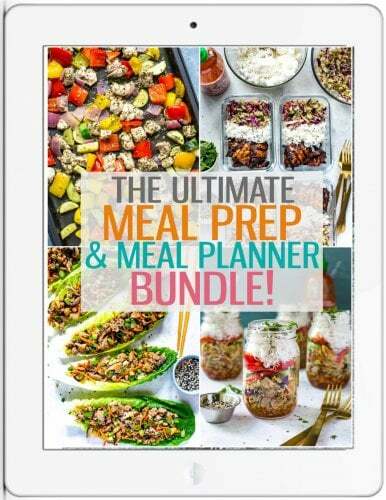 How do you meal prep and not get bored? I doubt that I will ever get tired of making meals ahead, but I totally get that some of you may feel this way. For some people, maybe the thought of meal prep means eating the same meals or flavours several times throughout the same week. Let me assure you; this is NOT TRUE at all! 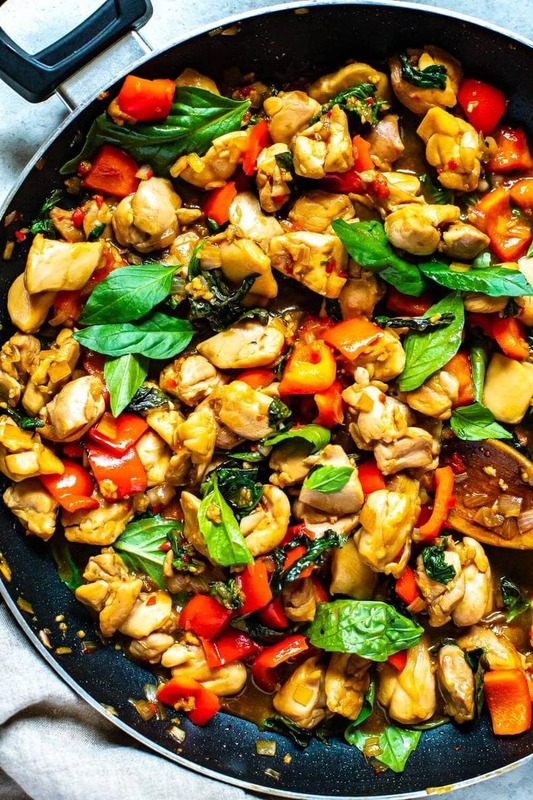 Have you SEEN this Thai Basil Chicken?! As an example, you can cook a whole chicken at the beginning of the week (or buy a rotisserie chicken) then use it to create several make-ahead meals that all use chicken. Maybe put together this Thai Basil Chicken using the thighs and Chicken Souvlaki Bowls using the breast. You'll have three completely different dinners, all with amazing flavour, and all of them will be ready to heat and eat. But here's something that some people forget; a lot of meal prep meals can be frozen, allowing you to eat them days or even weeks later! Meal prep doesn't have to be boring at all! Can you use regular basil instead of Thai basil? If you aren't able to find fresh Thai basil at the grocery store, check your local Asian market for it. Using regular sweet basil as a substitute is possible, but the flavor will be less intense, and much sweeter than with Thai basil. 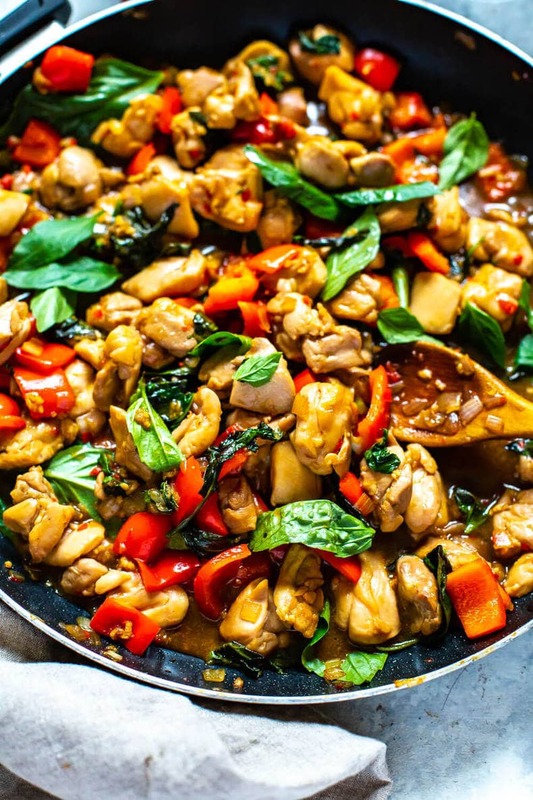 You may want to add some more sweet basil to enhance the flavours of the Thai basil chicken. 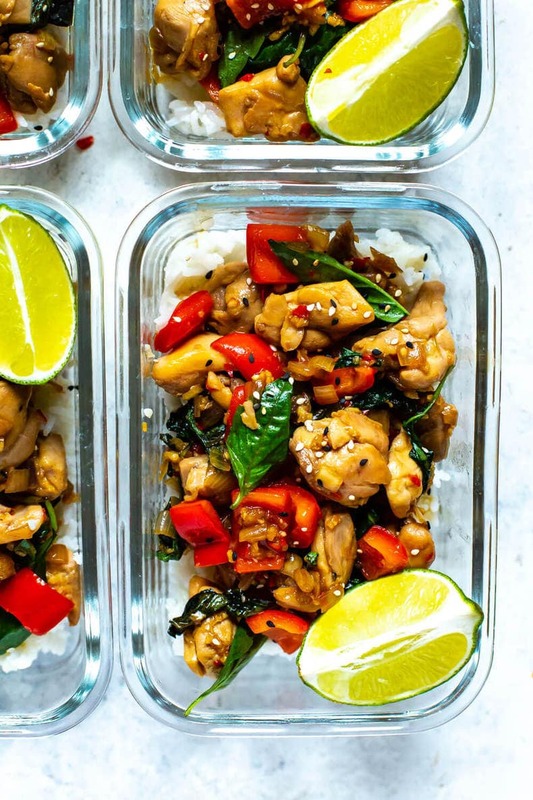 Grab some glass meal prep bowls if you plan on packing this Thai Basil Chicken up for lunch. And of course, I get all my free-range chicken from Butcher Box! 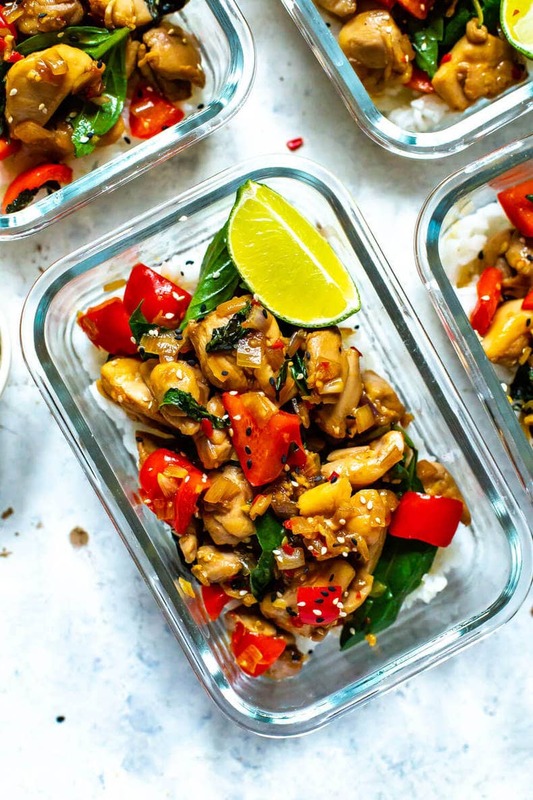 This Meal Prep Thai Basil Chicken is a healthy stir fry idea that doubles as an easy 30-minute dinner or the perfect make-ahead lunch - it's slightly spicy & packed with fresh herbs! Mix all sauce ingredients together in a small bowl and set aside. Meanwhile, get rice, water and butter cooking in a rice cooker while making the rest of the recipe. Heat olive oil in a large skillet over medium-high heat. Add chicken, shallots (or onion), chili pepper and a pinch of salt, sauteeing for 4-5 minutes until chicken is lightly browned. Add red pepper and cook another 2 minutes until peppers are tender. Add sauce and saute for 2 minutes until chicken is completely heated through. Turn off heat and stir in basil leaves. Serve by spooning chicken mixture and sauce over cooked rice, then garnish with sesame seeds and lime wedges if desired. Serve and enjoy!